Krosno Odrzańskie| A pair of Polish fisherman made an amazing discovery when they opened the belly of the 410-pound catfish they had just caught in the Oder river. The stomach of the monstrous fish contained fragments of human bones, as well as German military artifacts dating back to the Second World War. 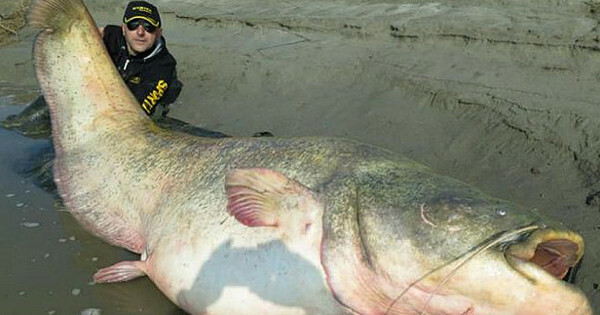 Alfons Brzozowski and Marek Zdanowicz were fishing near the Oder’s confluence with the Bóbr river on April 6, when they made an astonishing catch: a gigantic Wels catfish, measuring 12 feet (3.68 meters) and weighing 413 pounds (187.5 kg). Their celebration was rapidly transformed into interrogation, and then disgust, when they opened the animal’s belly. Among a large quantity of half-digested fish, they discovered an old metal insignia dating back to Nazi Germany, as well dozens of human bone fragments. The two fishermen rapidly contacted the police, who opened an investigation to determine the origin of the remains. The insignia found in the fish’s belly, turned out to be a German SS hat eagle, dating back to Nazi Germany, that was usually worn on the front of the SS dress hat. The examination of the bones enabled the authorities to determine that they belonged to a Caucasian man in his early twenties, who died many decades ago. The biologists who examined the fish, for their part, confirmed that the enormous specimen was probably aged between 90 and 110 years old, making it one of the oldest catfish specimens ever found. Further analysis of the artifacts and the bones have revealed that they had indeed been ingested by the fish during the 1940s, and were very likely the remains of a German SS officer, killed during the occupation of Poland. The team of forensic experts who proceeded to the tests, could not determine, however, if the man was actually killed by the catfish or if he was already dead when he was eaten by the animal. The stomach of the enormous catfish contained more than a dozen corroded bone fragments, mainly parts of a human neck and skull. The Wels catfish is a large fish native to wide areas of central, southern, and eastern Europe. With a possible total length up to 4 m (13 ft) and a maximum weight of over 400 kg (880 lb), it is the second largest freshwater fish in the region after the beluga sturgeon. Individuals of this species have been observed lunging out of the water to grab pigeons, ducks, rats, cats and even dogs, on land. Exceptionally large specimens have even been rumored to attack humans in rare instances, but this is the first time that human remains are actually found inside one of these fishes. A report in the Austrian newspaper Der Standard on 5 August 2009, mentions such a catfish dragging a fisherman near Győr, in Hungary, under water. The fish allegedly caught the man by his right leg after he attempted to grab the fish in a hold. The man barely escaped with his life, from a fish which must have weighed over 100 kg (220 lb), according to the fisherman. 7 Comments on "Remains of Nazi Officer Discovered inside 100-Year Old Giant Catfish"
What a shame the record-breaking fish had to die! That was my thought, too, MooseyKins! Ten artykuł nie jest prawdziwy, nie ma żadnych informacji na ten temat na polskich stronach internetowych. Amazing…Gruesome….Hope I don’t end up like that !!! !